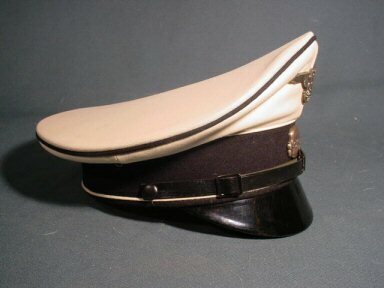 DESCRIPTION: This can be a field cap or an enlisted man's walking-out cap. 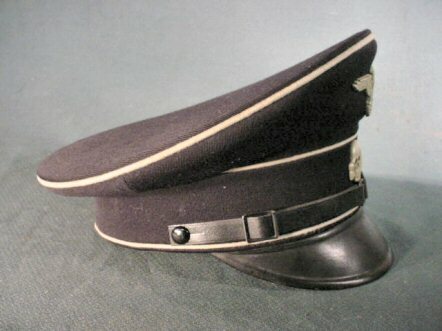 The Krätzchen-style of SS cap was patterned on the enlisted caps of the WW I army. 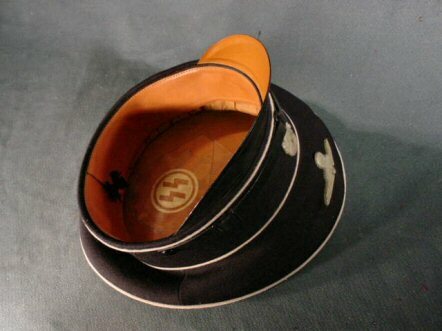 The cap is very rare, seeing use from 1933 until the end of 1934 or very early 1935. Hardly any were preserved and certainly they very probably were not war souvenirs brought back by GI's. 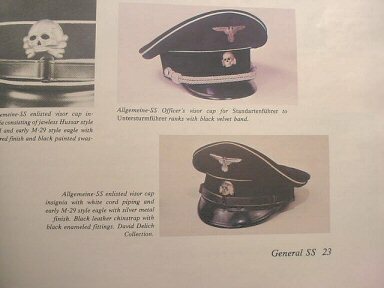 The cap is pictured being worn in Stan Cook and Rodger J. Bender's book The Uniforms, Organization, and History-Leibstandarte Adolf Hitler, Vol One, but we have seen no pictures of caps in collections in any of the books, including that one. It is (that rare!) 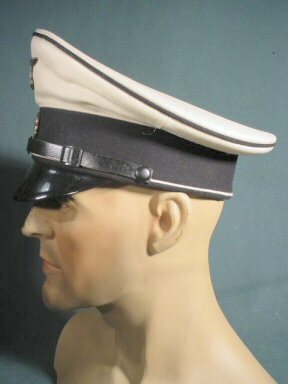 The cap is made of black cloth-the same as with the enlisted version of the service cap-with the notable exception of having no visor. 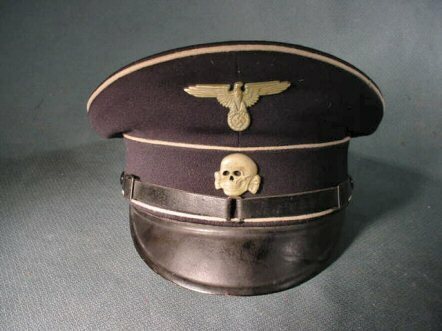 The cap was worn by recruits in training at both of the training locations associated with the Leibstandarte, the Sonderkommando Zossen, and the Sonderkommando Juterbog, north of Berlin. 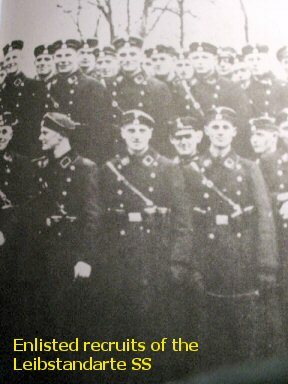 In addition to being used in training, there are photographs showing recruits in the service dress wearing the Krätzchen while in town after duty. 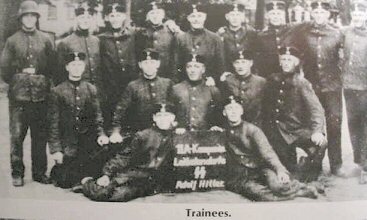 Photographs dating from 1933 to as late as the end of 1934 show enlisted men and junior NCO's of the various companies of the LAH wearing the Krätzchen with the black service-dress uniform confirming the idea that the original intent was indeed to use the Krätzchen in the same way it was used in the Imperial Army: As a lower enlisted rank's service cap in addition to its use as a field cap. 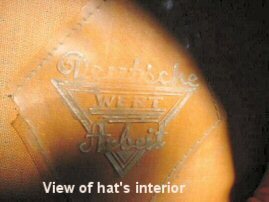 Two versions were produced; one with the white piping in three places, and one with the bottom piping omitted. Certainly the three-position piping example is the earlier and an extremely rare example. This is the one we offer here. 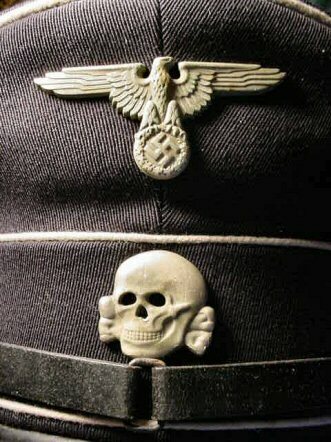 The insignia used on the cap was the standard first-type National emblem with the first-type Totenkopf worn on the cap band. We honestly thought we would never see an original Krätzchen and to now have one in this immaculate condition gives us great pride to have it on the pages of Germania. DESCRIPTION: This is an absolutely wonderful find. 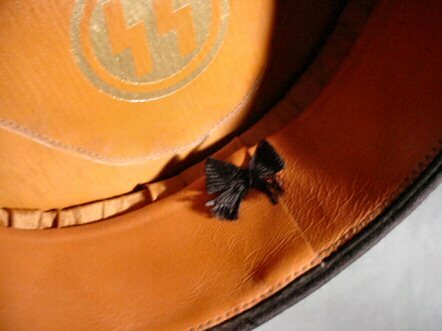 In many years traveling in Europe and viewing many collections, we have not seen any cap better in condition or shape. This is excellence personified. 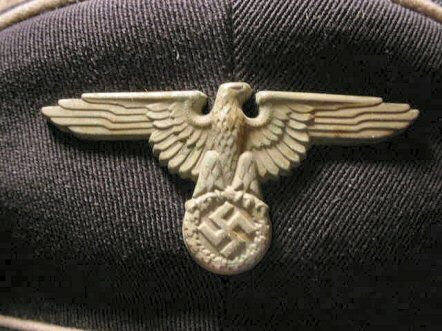 On a recent trip to Germany this cap was found along with another and bought from a family whose father was an SS Fördern Mitglied (supporting member). 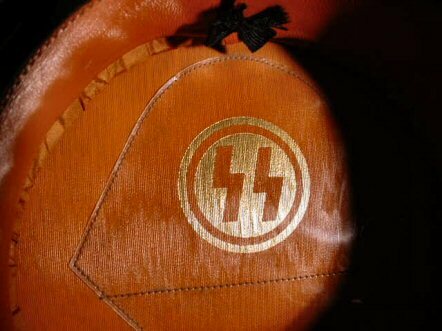 This was a group that was put together as a support organization for the SS and its Reichsführer, Heinrich Himmler. 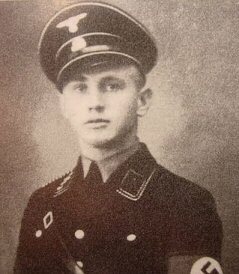 This man, whose family insists on anonymity, was also a member of the group known as the Friends of the Reichsführer-SS. This was the club whose members included bankers and industrialists. 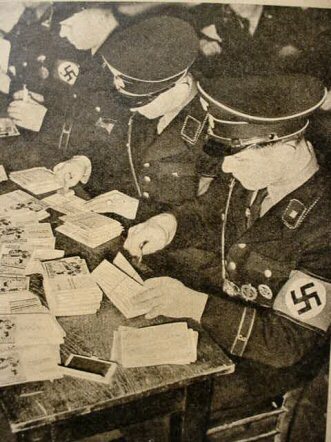 Its membership register reads like the Who’s Who of Germany. 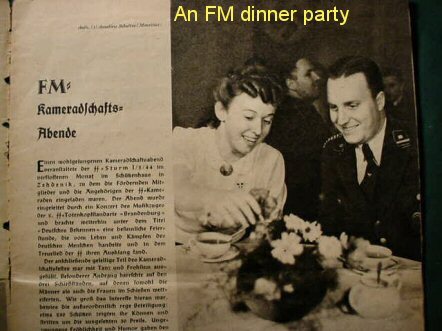 It included representatives of the Reichsbank, Deutsche Bank, Hamburg-America Shipping Line, I.G. Farben, Siemens, etc. Members of this family were rather well-to-do Rhinelanders and landed gentry. 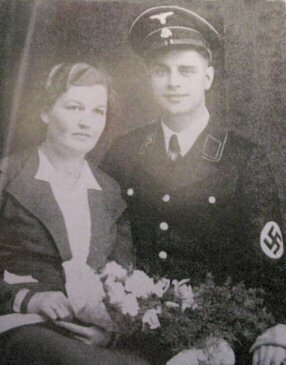 The father was a devoted National Socialist and certainly an SS supporter, who often boasted that H. Himmler was a guest at their home, twice. 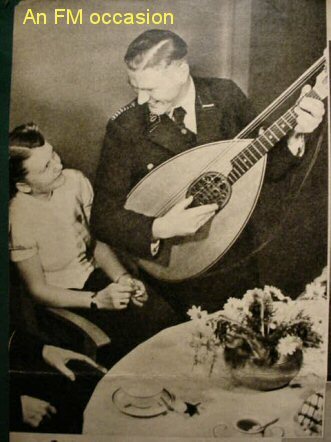 He was not only a member of F.M., but was an active enrolled recruiter and as such was authorized to wear the uniform. 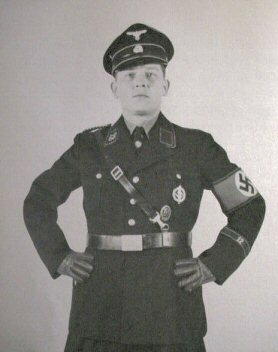 He had the black uniform and even the white, which he wore proudly at meetings held for recruitment purposes. We, at first, were able pick up one of the black visor caps and the super-rare white one, as well. Eight months later we were called again by the family and another black visor cap had been located at the man’s brother’s home. We subsequently sold the first black cap and now have the second one, which is all as nice as the first. 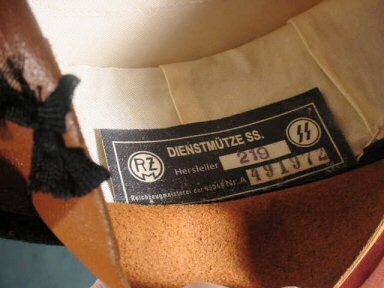 This one only differs in that the ‘RZM’ label is different and the ‘RZM’ that often is stamped inside the brim does not appear. This difference is quite common. 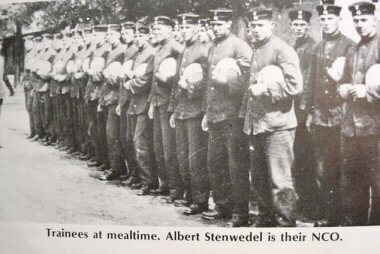 The rest of the uniforms were sold to a German dealer. We were quite disappointed in this revelation. The dealer bought those 20 years ago and the only reason he didn’t get the caps was that the family had hidden them in 1945 and couldn’t determine just who had them. Normally, F.M. 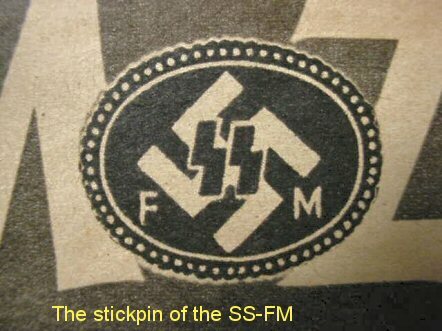 members wore only the F.M. 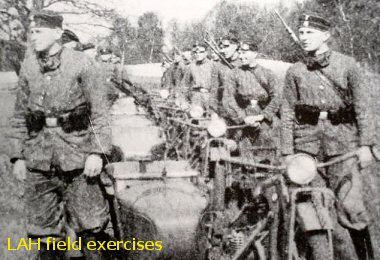 stickpin, but some who were in special-purpose assignments like this gentleman wore the snappy black uniform. 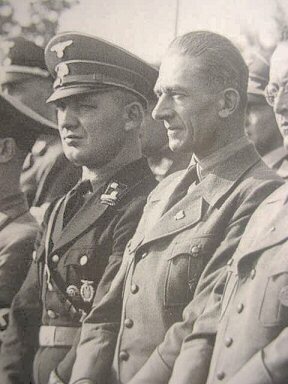 This man must have been considered a rather special case because of his membership in the ‘friends’ and to also have the white uniform must have been due to his influence and value to the party and SS. 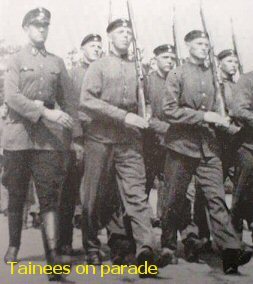 Still, he did not reach officer rank, but that was because F.M. people working in that function where not accorded this privilege. That must be attained only by 100-percent official participation with SS number being issued. The cap is without a doubt stone mint because it was worn only for meetings of the F.M. It is 100-percent original, of course, and only a pseudo-intellectual cretin could question it and there are some of them about (x-spurts). In any case, this piece and the others bought from this family are genuine, beautiful, and the best you will ever see. The size is small. 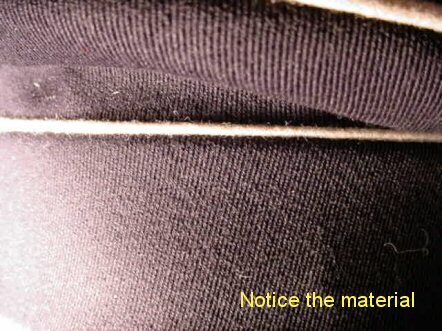 The material is the twill fabric that is correct for this style cap. 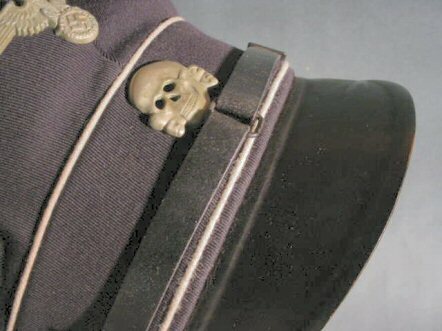 The skull and eagle cap devices have a grey-green finish that you seldom see, unless the item would be unused and untouched. The strap is in fine shape with no cracks. 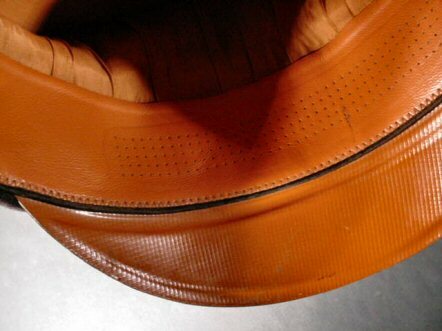 But one can see that it is about 70 years old and has taken on a look that only aged leather will. What more can we say? 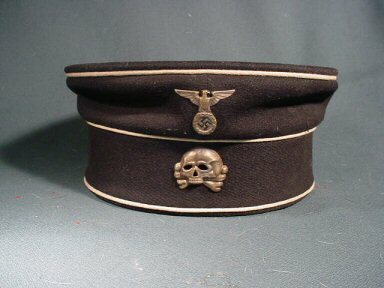 Here is the ultimate SS enlisted man’s service cap. They can’t come better! 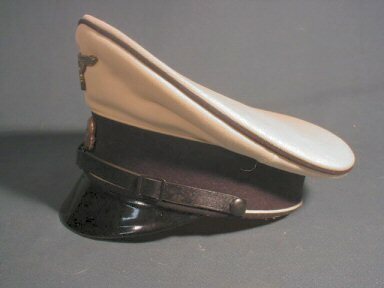 DESCRIPTION: Worn with the white uniform, this is the extremely rare visor cap for the Allgemeine-. This (stone-mint) specimen was obtained from the family whose father was in the SS. 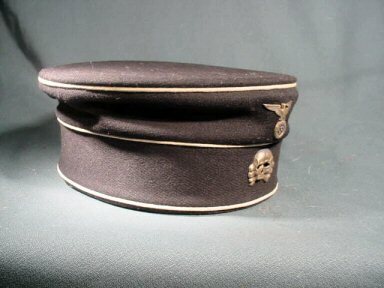 This cap and a black enlisted ranks' cap were stored together for all these years in Halle in the former DDR. 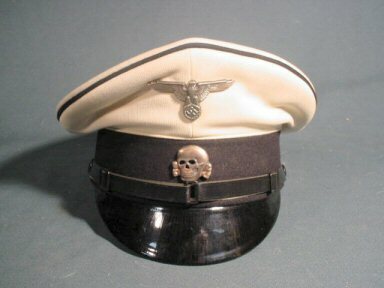 At some point this white cap was worn only for some sort of young communists' league celebration. 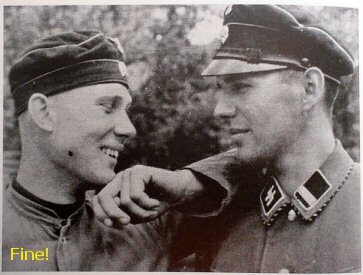 At that time the teenaged celebrant took off the SS insignia and no one was the wiser. 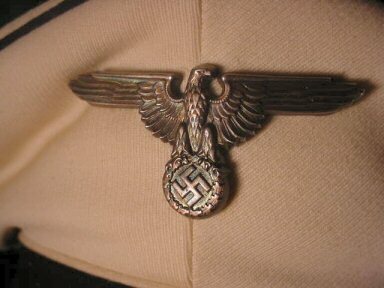 The unfortunate part is that the skull and eagle were lost over the years and we bought the cap without this. 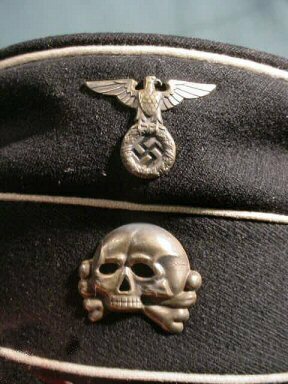 What a fantastic gem this would be if that skull and eagle would have been the type that an SS man would have been willing to make an extra expenditure on, and this would produce a most elegant and rare cap with the wonderful silver cap set as may be seen in our pages. 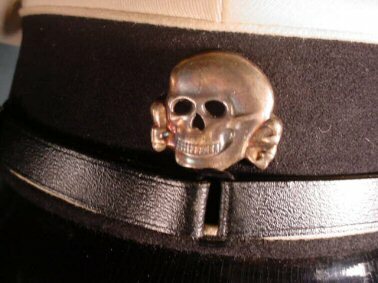 Although the silver sets were mostly worn by officers, there was no adverse regulation that would preclude an enlisted man with Korpgeist from wearing it if he so chose. The cap is near mint! 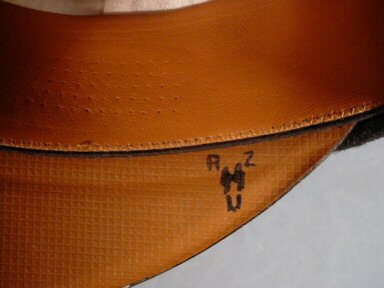 and has all the proper trappings to include the mandatory "RZM SS" stamp a the right side of the inside visor and the label inside. In the interest of completeness we have added a set of skull and eagle to it, but it should be understood that it is not the original set. The set we added seems to be authentic although the skull is questionable! (much copper color shows through). 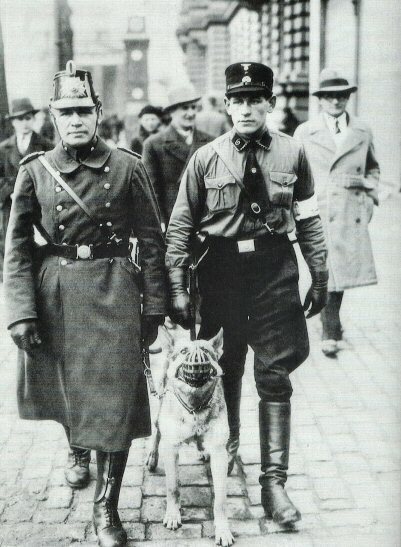 The men who wore these white uniforms were often on special detail and were elite; chosen from the elite for such duty as guarding the Führer, himself, at the chancellery or the Obersalzberg. 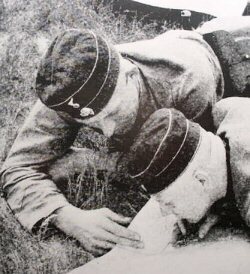 They were most often from the -Leibstandarte Adolf Hitler detachment. 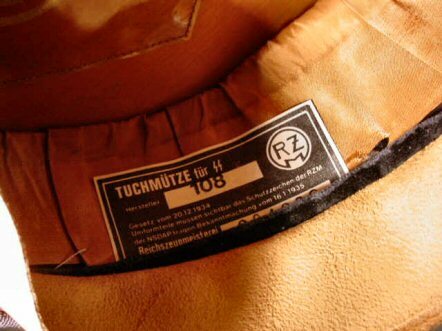 In observation of this fact it is indeed plausible that the sweat-band tag that shows it to be "RZM"-approved as a Dienstemütze for the cap with the proper numbers. 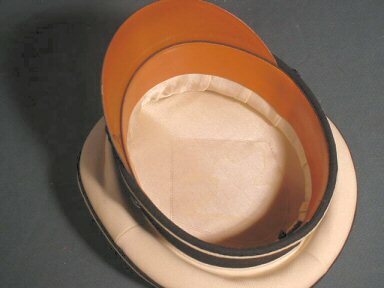 The top has the typical cotton (file) fabric while the band is of a felt-style cloth. The size is small. The cap would be considered ultra-rare and the condition breathtakingly fantastic! We are extremely proud here at Germania International, LLC to offer this extraordinary cap.